40 in. x 100 ft.
40 in. x 300 ft.
Made from plastic material, our collection of table rolls are certain to meet all of your party needs. 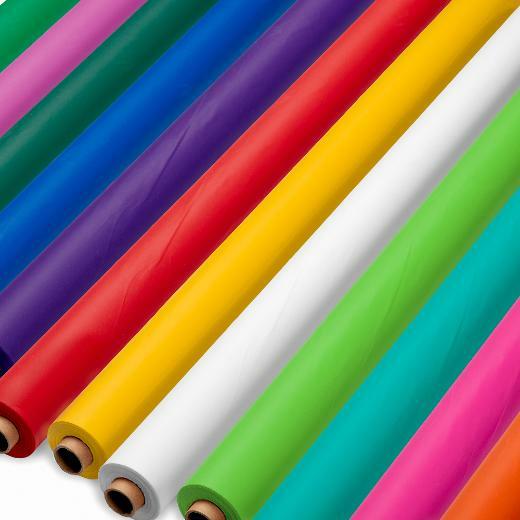 Available in a wide variety of colors and sizes, our table rolls are the perfect addition to any event - from birthday parties to anniversaries, weddings to banquets. My party would not have been the same with out these table covers!! The quality of these were amazing and clean up was easy too! all we had to do was roll up the garbage on the table and throw away! The kids made lots of spills too, and we didnt have to mop it up...we just threw it away! I bought these for my dinner party and i needed a lot for many tables. i used this to wrap all the tables in. It was fast and easy to use and clean. I was excited to see the exact color I had in mind on this website. Lavender is my favorite and I used these table rolls for my birthday bash. It was superb Went beautifully with my decor. I still have loads leftover!! The colors are clear and true as shown on the website. The plastic is of good quality and not easily torn. I use 8 colors every year for our CFA cat show and this is the only website that I can find that sells all of the colors I need to order. Yea! Perfect for my pastel themed party - I bought all the light colors, cut them up, and I made backdrops out of the cut strips.